In 1859 a groundbreaking book by naturalist Charles Darwin, On the Origin of Species, introduced us to the theory of evolution. Darwin was the talk of the world. In 1863 an ancient marble statue was unearthed on the Aegean island of Samothrace. Eight feet tall, it depicts the goddess Nike alighting on a ship to celebrate a Greek naval victory. She may have looked like this photo reconstruction, but by the time she was discovered her head and arms had been lost. Nevertheless, what remained was acclaimed to be the greatest masterpiece of Hellenistic sculpture. The original was installed at the top of a staircase in the Louvre, and many reproductions were displayed elsewhere. 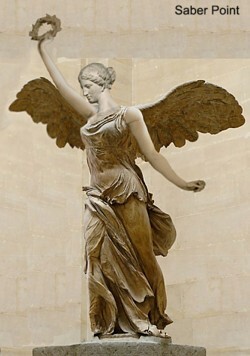 Winged Victory was the talk of the world. In 1865 a future accountant was born to Hiram and Ann Martin in upstate New York. His parents named the boy Darwin. This Darwin was not the talk of the world. Not right away, at least. But he would help commission buildings that were. 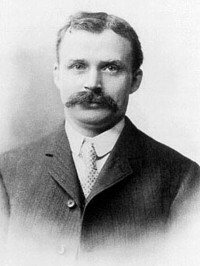 John Larkin established a factory in 1875 on the east side of Buffalo. At first, his only product was a yellow laundry bar called Sweet Home Soap. The business grew quickly, however, and eight other cleaning products were added in the next few years. Shopping by mail, Factory to Family, was becoming an economical way for rural folks to obtain city goods. John's brother-in-law Elbert Hubbard pioneered the idea of offering premiums, and the mail orders and money poured in. Down in New York City, Darwin Martin and his older brother were selling Larkin soap door-to-door. 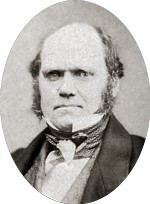 Darwin proved to be good at keeping records, so John relocated him to Buffalo to help him in the office  at the age of 13. Maintaining customer accounts and tracking sales required cumbersome ledger books. Everyone did it that way. But Darwin had a better idea. Inspired by the card-indexing system at the local library, he converted Larkin's records to efficient card catalogs. When an account was paid, its card was moved to a mailing-list file. Martin's initiatives were exemplary, says the Pine Mountain Settlement School, and were later followed by many companies. His efforts were recognized by Larkin and were richly rewarded by the company which continued to promote him and his good work. He became secretary of the corporation and built a personal fortune of more than a million dollars. In 1902, he visited another brother in Chicago. Captivated by certain newly built houses in suburban Oak Park, he sought out the studio of the architect. 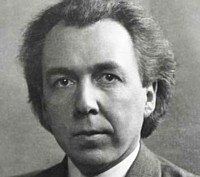 Frank Lloyd Wright's radically different ideas made quite a favorable impression on Darwin Martin. He asked the up-and-coming 35-year-old architect to design a house for him too, in Buffalo. The site would be on Jewett Parkway, in a neighborhood laid out by the celebrated Frederick Law Olmsted. Meanwhile, the Larkin Company now served over two million customers, having expanded into dry goods, china, furniture, and groceries. A new office building was needed. John Larkin was generous to his employees, and the company was willing to pay the high price for a well-designed, innovative structure. 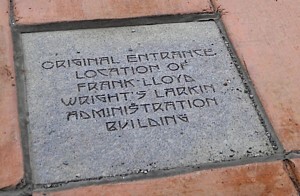 Martin was able to convince Larkin to give that commission to Wright as well. And this is the Administration Building that resulted. It was finished in 1906 at the cost of four million dollars. Just to the left, employees entered through doors consisting simply of large sheets of plate glass, a Wright innovation. There was no traditional façade. Towers in the corners, topped by skylights, concealed the staircases and elevators. And to the left of the entry stood the massive five-story edifice where 5,000 letters a day would be processed by 1,800 clerical employees. Because the site was in an industrial district, there were comparatively few windows. It would not do for a soap manufacturer to send its customers soot-covered mail, so the windows were sealed shut and the building was air-conditioned. Fresh air was taken in at the roof level, where a skylight illuminated a central atrium. Balconies faced this light well, turning their backs on the smoke of the railroad locomotives outside. During a visit to Buffalo on July 19, 2017, I went to Swan Street and paid my respects to that one pillar. 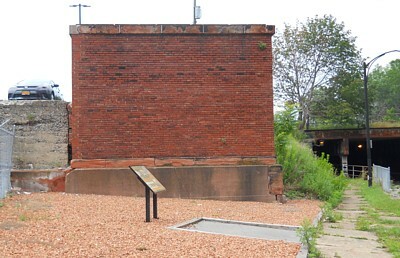 It originally formed a pier at the north end of the western fence. 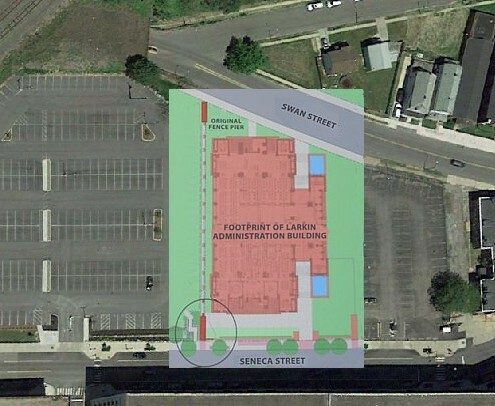 In 2015 the new owners of the site, the Larkin Center of Commerce, reconstructed the other end of the fence with a glass ghost pier. It's circled in the footprint view above. 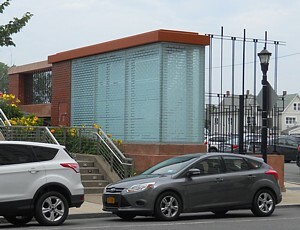 A granite marker in the Seneca Street sidewalk memorializes the front gate. 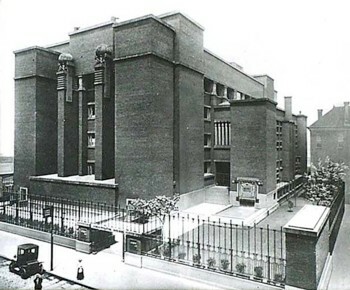 Behind the ghost pier once rose the magnificent Larkin Building, strong, powerful, monumental. We can just imagine how it looked. But now, thanks to modern technology, we don't have to imagine it! 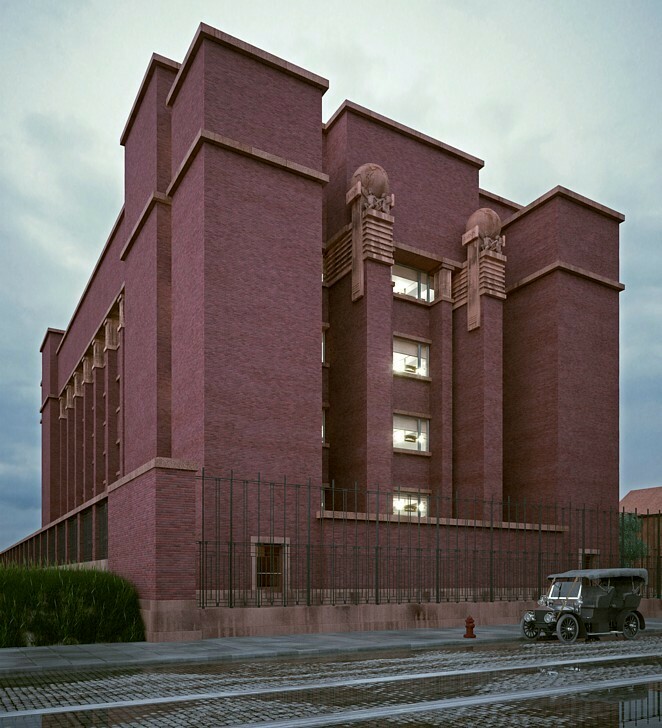 Using AutoCAD and other programs, beautiful color views of the long-gone landmark have been generated by Spanish architect David Romero. And there's the pier in the foreground, no longer a ghost. Romero's renderings are identified here by red outlines, while gold outlines identify photos taken by me in 2017. Ken Elwood has put together an inspiring virtual tour on video. 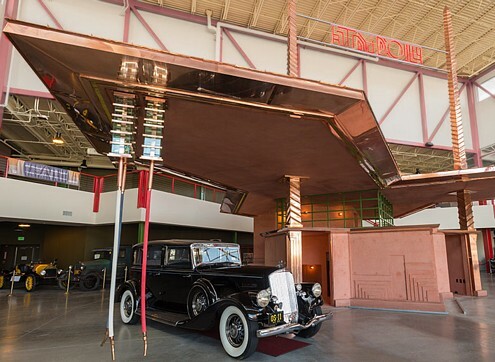 Other photos in this article have been gathered from various Internet sites, in particular the Martin House Restoration Corporation and the Pierce-Arrow Museum. 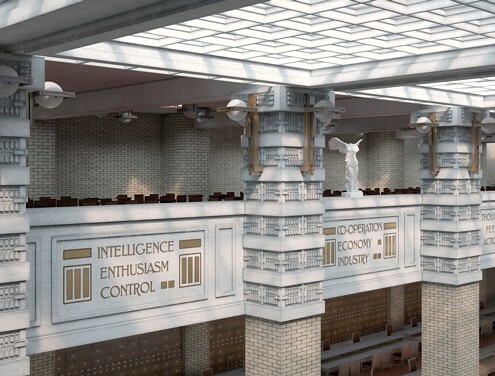 Inside the building, vertical piers of cream-colored brick projected slightly from the balconies and rose powerfully toward the light from the sky 76 feet above. See the plants growing under the skylight? That's the conservatoryon the fifth floor. Mail from New York, Ohio, and Illinois was processed on the fourth floor. Other sorting took place on the third, while typewriter operators occupied space on the second floor. And in the center of the main floor were the desks of the two men who actually ran the company for John Larkin: office manager William Heath and company secretary Darwin Martin. Some of the steel desks had tops that were adjustable to various heights, and some had seats attached, eliminating the noisy scraping of chair legs as well as the need for janitors to pile 1,800 chairs onto desks each night. In the restrooms, Wright installed wall-mounted toilets and hanging walls between the stalls, all to make it easier to mop the floors. 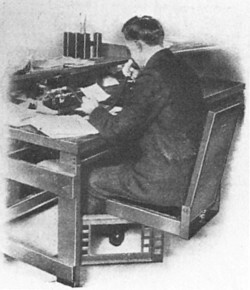 This employee is answering correspondence by dictating his reply into a Commercial Graphophone, of which the company purchased hundreds. The machine is built into the desk, and blank wax cylinders are waiting on the shelf. The recordings will be transcribed later by a typist. When the employee leaves for the day, he will stow his seat by folding the backrest forward and swinging the whole thing under the desk. The sound-absorbing floor, a mixture of excelsior and magnesite (a mineral imported from Greece), was poured over on a cushion of felt. Music was piped in, so to speak. 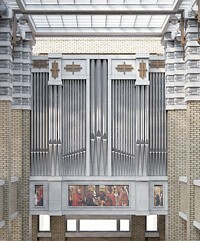 On the main floor a four-manual Möller organ console faced Mr. Larkin's portrait, and 100 ranks of pipes were installed on the upper level opposite the conservatory. A replica of the Winged Victory of Samothrace graced the topmost balcony. Here the company restaurant served shifts of as many as 600 diners at once, seated at rectangular tables. The white ornamentation, molded from magnesite, contrasted with the simplicity of the solid masses below. Above the restaurant was a roof garden paved in brick. At the south end, Inspiration Point offered views in all directions as well as into the interior of the building. At the other building site out on Jewett Parkway in northern Buffalo, the architect had again been given complete freedom and an almost unlimited budget. By 1907 Darwin Martin's house was essentially complete. 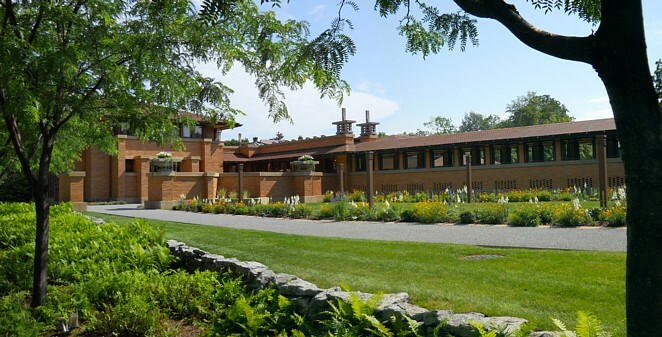 I toured it 110 years later, making it twelfth on the list of Wright buildings I've been privileged to enter. 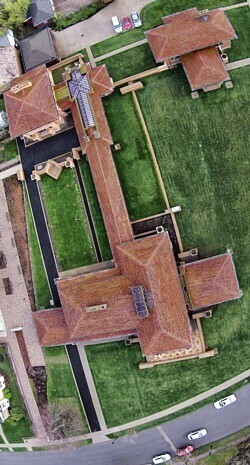 The photo above is centered on the main house. 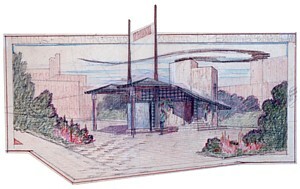 Carriages would drop off their passengers at the covered porte-cochère in the foreground, then continue to the stable or carriage house on the far left. The buildings are connected by a long covered walkway called a pergola. On the right is a drone's-eye view. 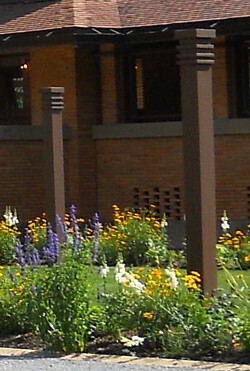 The carriage house is on the upper left, and next to it, the cross-shaped skylight at the north end of the pergola covers a small greenhouse. 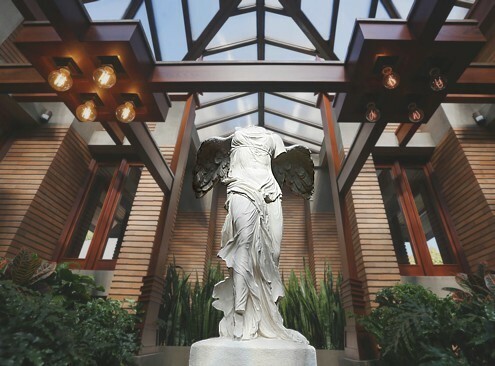 And in the middle of that conservatory is a full-size copy of the Winged Victory of Samothrace! When one stands at the home's front door, one can look straight down the pergola and glimpse this statue from over 100 feet away. Other little details caught my attention. What do you suppose was the original purpose of these columns? The docent told my tour group they were meant to support clotheslines in the drying yard (drag your cursor over the words to see the surprise answer). If I were designing them, the square rings at the top would have been spaced equally. However, Mr. Wright had a much better eye for aesthetics than I. The docent also explained that rainwater in the gutters has to go somewhere, but ordinary downspouts (red) would have been totally out of keeping with the home's horizontality. 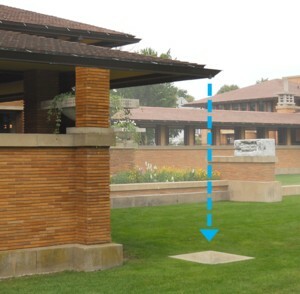 So Wright let the water escape from the gutter through a little round drain, then fall freely (blue) into a catch basin sunk into the lawn. 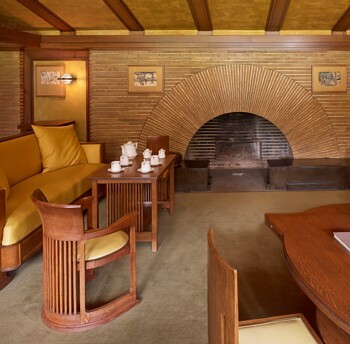 Inside the Darwin Martin House, three great rooms have no walls nor doors to separate them. The space flows freely from the library in the foreground through the living room to the dining room in the background. The intervening transition areas are indicated subtly by flanking piers and lowered ceiling beams. 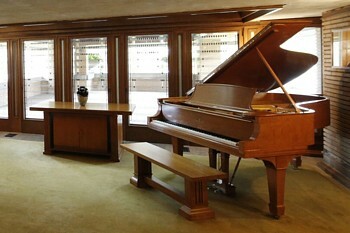 Again, Wright designed everything in the building  including the art glass windows, the furniture, even the grand piano  as part of an integrated composition. For one small example, in a corner stands a table that turns out to be a bookcase. But it doesn't hold its books upright. Rather, each narrow shelf, echoing the horizontal Roman bricks, holds one volume of an encyclopedia horizontally. Below we see the reception room adjacent to the entry hall. The docent mentioned that some visitors think the furnishings might be for a children's tea party. Well, Americans were smaller a century ago. 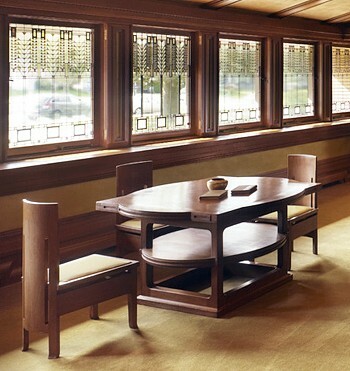 Not only that, but Wright aimed for beauty in his furniture, such as the famous barrel chair seen here. He did not necessarily consider ergonomic comfort. As I stood beside the card table in the foreground, I noticed there was no room for one's knees. Here's that table from the opposite angle. What I haven't told you is this: Like the Administration Building, this property fell into disrepair after the Martins passed away, and it reverted to the city for back taxes. The carriage house, conservatory, and pergola were demolished in 1962 for an apartment complex. But through the efforts of many, including Sen. Daniel Patrick Moynihan (who proclaimed the house a national treasure), the main house was restored. Then between 2004 and 2007, the other portions were reconstructed according to the original plans. Some work is still going on, especially in the bedrooms on the second floor, but for the most part the house now looks again as it did in 1907. Back in Buffalo's downtown, there's a gas station surrounded by classic automobiles inside the Pierce-Arrow Museum. It was orginally intended to be built on the corner of Michigan and Cherry, one mile to the north. Wright sketched this ornament to the pavement in 1927, labeling it as a standardized type for a whole chain of filling stations. However, it was never actually constructed until recently. It's stylish and futuristic, but I have some quibbles. The observation room is raised like a control tower up a narrow flight of stairs. It even includes a fireplace, indicated by the curling wisp of smoke in the sketch above. As a result, the canopy over the cars is unusually high. Rain could blow in on the wind. The canopy and the skinny 45-foot poles or totems supporting the sign are assembled from hundreds of gleaming pieces of copper. That seems extravagant, but it did win a 2014 award from the Copper Development Association. Nowadays we never actually see the gasoline we're buying; we trust the numbers on the display. But in the early days of automobiling, you'd pull up to a pump like this. If you asked for three gallons, the attendant would work the lever to force that much up into the transparent container. You'd visually confirm the amount before he opened a valve on the hose to let the fuel flow down into your tank. Wright's design relocates the containers to the canopy, so the only obstacles at ground level are long dangling hoses. Would this arrangement have led to problems of practicality and safety? We'll never know. 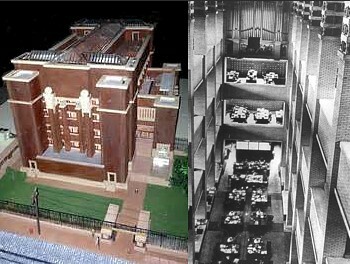 The building that I'd actually like to see reconstructed from Wright's drawings is the Larkin Administration Building. The former site is still there, guarded by the ghost pier in the background. For 67 years it has been used for nothing but a parking lot, currently $3.00 for two hours. Somewhere there must be some wealthy lover of architecture willing to spend a billion or so to bring this masterpiece back to life! 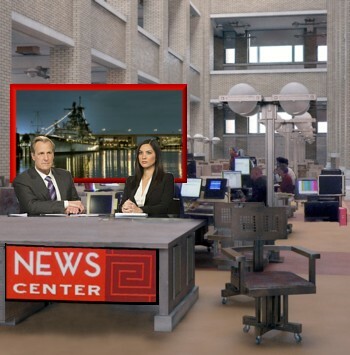 For example, the main floor could be used as a TV newsroom. The weatherman could prognosticate from a balcony. 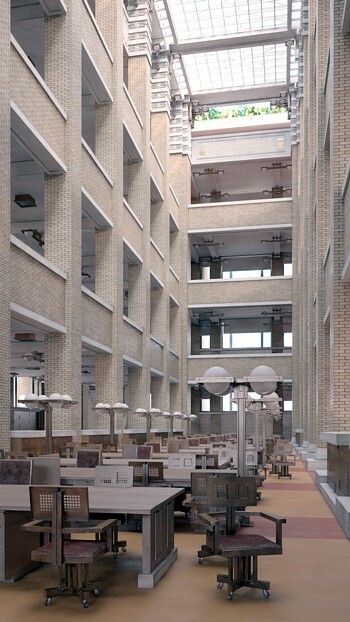 Of course, the station wouldn't need all the office space, so part of the building could be a museum, furnished as it was in 1906 with ancient technology like graphophones and typewriters and mailbags.